I love the days when we want a light supper and I find that I have (almost) all of the ingredients to make a dish such as Stuffed Peppers. I didn’t have red peppers, but orange ones worked just as well. I had been wondering how to use up the goat’s cheese languishing in the fridge and with loads of parsley and coriander still in the garden, only dill was missing so I added a few chopped chives instead. 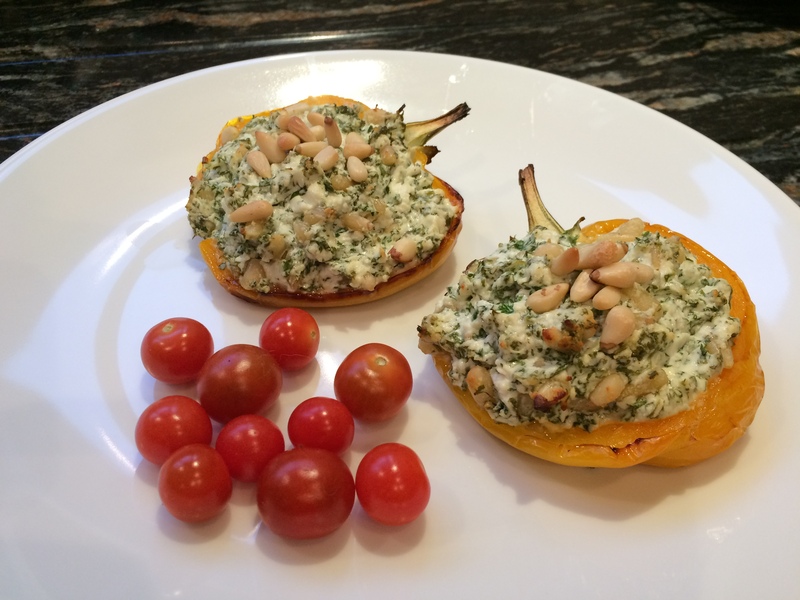 I have stuffed peppers before but this recipe is from The Medicinal Chef by Dale Pinnock and he definitely has got the mix right with soft goat’s cheese, loads of fresh herbs and that splash of lemon juice. I do admit to adding a few more pine nuts as they are my favourite nut. Cut the peppers in half length-ways and scrape out the seeds and white membrane. Place the pepper halves cut-side down on a lipped baking tray and add a little water. Bake in the oven 200° for about 15 minutes, or until tender. Meanwhile, place the goat’s cheese in a bowl and break it up with a fork. Stir in the herbs along with the olive oil and lemon juice. Season with salt and pepper. Mix well. Remove the peppers from the oven and turn them over to expose the insides and fill the halves with the cheese mixture. Top with pine nuts and return to the oven for another 10 to 12 minutes or until lightly browned. It is not a very good photo of the peppers and tomatoes; I should have taken it from a different angle as the tomatoes are tiny homegrown ones which I grew this year in hanging baskets. They were a free gift and unfortunately I don’t know the name of them, but they are the sweetest tomato I have ever tasted and they look too large in the picture. This entry was posted in Supper, Vegetables, Vegetarian and tagged Goat's Cheese, Healthy Eating, Herbs, Peppers, Supper, Vegetarian. Bookmark the permalink.